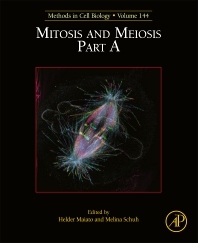 Mitosis and Meiosis, Part A, Volume 144, a new volume in the Methods in Cell Biology series, continues the legacy of this premier serial with quality chapters authored by leaders in the field. Unique to this updated volume are chapters on Analyzing the Spindle Assembly Checkpoint in human cell culture, an Analysis of CIN, a Functional analysis of the tubulin code in mitosis, Employing CRISPR/Cas9 genome engineering to dissect the molecular requirements for mitosis, Applying the auxin-inducible degradation (AID) system for rapid protein depletion in mammalian cells, Small Molecule Tools in Mitosis Research, Optogenetic control of mitosis with photocaged chemical, and more. Helder Maiato graduated in Biochemistry and holds a PhD in Biomedical Sciences from the University of Porto. He was a visiting PhD student at the University of Edinburgh (UK) and a Post-doctoral Research Affiliate at the New York State Department of Health (USA). At present, he is a Principal Investigator at the Institute for Research and Innovation in Health (i3S) and Invited Professor at the Faculty of Medicine of the University of Porto (Portugal). In 2015 he was honoured with the Young Investigator Award from the Louis-Jeantet Foundation and was recently elected EMBO Member. He served as National Counsellor for Science and Technology to the Portuguese Prime Minister and founded Yscience (www.yscience.pt), a pilot non-profit initiative that brings together scientists to promote science education in young children. His main research interest is the spatiotemporal control of chromosome segregation during cell division.